Guitarist/singer-songwriter David Bromberg plays WBAI's Free Music Store with his band the Fabulous Torpedoes, consisting of Steve Burgh, bass and vocals; Doris Abrahams, vocals and guitar; "Blind Erik Flatpick" Frandsen, vocals and guitar; Jeff Gutcheon, piano and vocals; Kenny Kosek, fiddle and vocals; Andy Statman, mandolin; and Gary Sun Luck, congas. WBAI's Barbara Oka and Dan Kavanaugh introduce the program. In the first part of this program, the band performs Hardworkin' John, Suffer to sing the blues, I am a man of constant sorrow, Demon in disguise, Big time woman (with Abrahams on vocals), Set me free (with Abrahams on vocals), Up is a nice place to be (with Abrahams on vocals), and Lonesome Dave's lovesick blues. Recorded in stereo by David Rapkin and Tony Elitcher on March 3, 1972 by WBAI's Music Department. 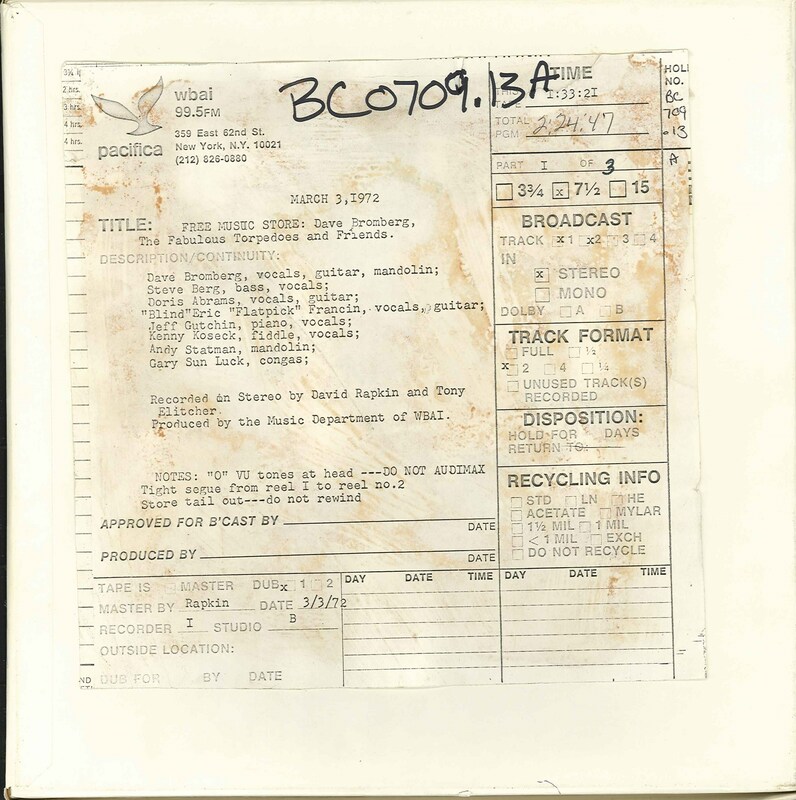 This recording was formerly cataloged as BC0709.13A. Begins with 30 seconds of tone. Muffled levels on first song (likely from sound mix). 3 reels (145 min.) : 7 1/2 ips, mono.